Synchronized skating is a discipline where up to 20 skaters (depending on level) skate as a team, moving together as one unit. All the skaters in the team must be similarly competent at a wide variety of skating skills. The team performs a program to music including specified elements and step sequences. Synchronized skating uses the same judging system as singles, pairs and ice dance. The first synchronized skating team was formed in 1956 in Michigan in the USA and the sport has been growing in popularity ever since. The ISU held the first Synchronized Skating World Championships in 2000 in Minneapolis, USA. Synchronized skating is not currently an Olympic sport but this is under review due to its growing popularity. 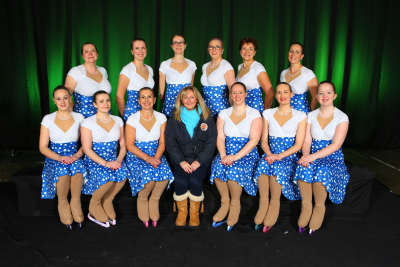 We currently have three Synchro teams: Preliminary, Junior B and Adults. To join our Preliminary team you need to have passed Level 10 Learn to Skate and be under the age of 21. They currently train on a Friday evening from 5.45 to 6.45 on ice and off ice from 7pm. The cost for this team is currently £50 per month payable on the first of the month. To join our Junior B team you need to have passed Field Moves Level 4 and be between the ages of 13 and 19. They currently train on a Friday evening from 5pm-6.45pm on ice and off ice from 7.45-8.45pm. The cost for this team is currently £70 per month payable on the first of the month. We offer a two week free trial to anyone interested in giving it a go, please contact Team Manager - Beverley Winspur Email: beverleywinspur@yahoo.co.uk. 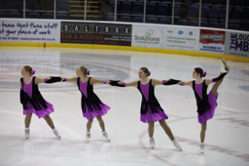 This year we have competed in Cardiff and Nottingham at the British Synchronised Skating Championships, next year we hope to compete internationally. FUSION Behaviour Policy for Committee Members, Chaperone, Coaches.